Three more weeks to apply! It’s time to submit your entries and gain the recognition you deserve for stellar advancement work produced in 2017. Scrutinize the Prix d’Excellence categories and the revised Entry Instructions. Check the FAQs for guidance and answers. Submit your entries by February 28, 2018. 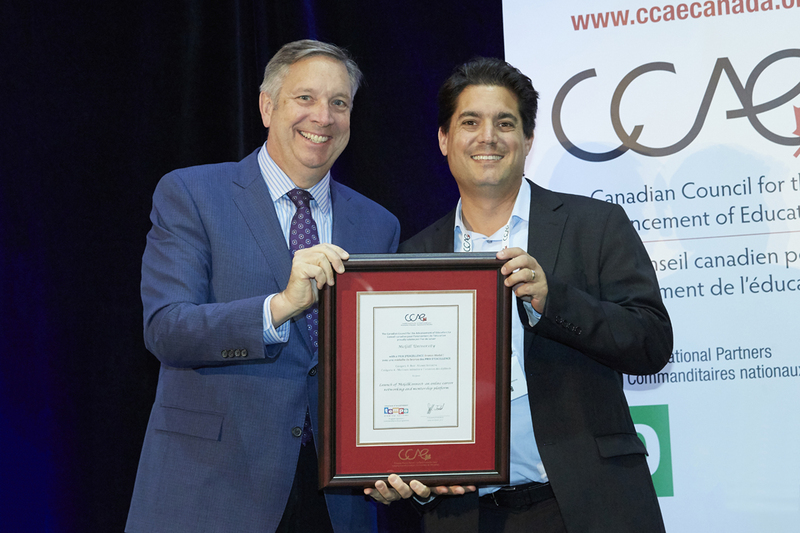 CCAE President Jeff Todd presents Derek Cassoff with a Prix d'Excellence for McGill University. Prix d’Excellence judging takes place through the month of March. Please volunteer as a host coordinator or category judge to help keep this prestigious award program vibrant and successful. Avoid volunteering to judge any category in which your school intends to submit an entry. Check out the fantastic sessions & presenters! A dynamic and varied #ccae2018 professional learning program is in the works for June 5 - 7 in Halifax. Staff in every advancement discipline and at any expertise level: you will find sessions that inform, inspire and send you home with proven strategies to implement in your own shop. Review the first set of session descriptions and presenter profiles, and check back in two weeks. Much more to come! Get inspired! View the #ccae2018 video. Register for the National Conference. Thank you to the #ccae2018 Sponsors. The deadline for expressions of interest is Friday, February 16, 2018. More information and the on-line nomination form are posted on the CCAE website. The deadline for expressions of interest is Friday, February 16, 2018. Guy Larocque has been appointed Associate Vice-President, Alumni Relations at the University of Saskatchewan. Larocque currently serves as Director of Alumni Engagement at York University.